The UMC in Bulgaria has more than 150 years of history behind it. As a minority denomination, it often struggled to survive — especially in the 40 years after the Second World War when almost all church activities were forbidden. By 1989, only three of the original 16 local churches had survived. But as a result of a huge commitment, the church was structurally re-organized and filled with life. At the center of this growth process, the founding of new churches exists side by side with the consolidation and stabilization of the existing ones. Many local churches and individuals have recognized that in a society going through a radical transition they are only credible when the proclamation of the Gospel goes hand in hand with practical help. Their current activities therefore combine both words and deeds in many different ways (e.g. ministry with prison inmates, educational programs, ministry with homeless people, etc.). Children and youth as well as people from the margins of society – particularly members from minority groups (Roma, Armenians, Turks) – are given special attention. In so doing, the UMC in Bulgaria has succeeded in becoming a model of peaceful coexistence and collaboration of people belonging to various ethnic groups – and this is a very important Christian witness in a region still challenged by ethnic and religious tensions. After the political changes of 1989/1990, various mission activities led to the birth of many independent churches. Some of them even called themselves Methodists. But this Methodist work was discontinued almost everywhere. The roots of the current UMC go back to 1995, when an independent missionary from the USA with United Methodist background went to Cluj-Napoca. Together with his wife he ministered to the people in this area, set up homegroups, distributed medicines and food, while bringing the good news by doing all this. The Romanian leaders of the churches in Miceşti and in Cluj kept in touch with him after his return to the USA in 2006. It then became obvious that for sustainability and future growth the churches should look for a church home. After visits, conversations and prayerful consideration they decided in 2011 to join the UMC. In 2014, a third church was established in the city of Sibiu. 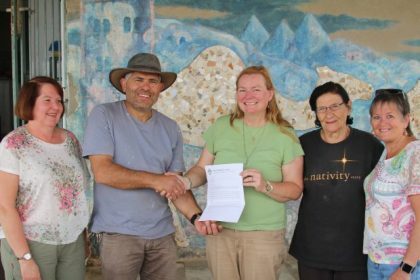 The village ministry around Cluj-Napoca, including diaconal activities and humanitarian aid, is still a very important part of the work and provides many opportunities to preach the Gospel and to put love into action.